How many times have you longingly gazed through the window at another van stopped at the light with all passengers calmly enjoying a video or show in the car? Getting back to reality, you hear your youngest scream as the oldest child kicks the back of her seat. Ah, driving with the family while doing errands can be quite the stress-management event. Those short trips to the store don’t really merit playing a game in the car and those longer trips on the road often have far too much time and too few games available. After all, you can only play punch buggy so many times! 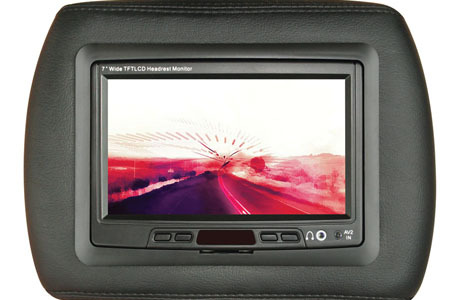 What your family needs is a mobile video system for your car or truck. 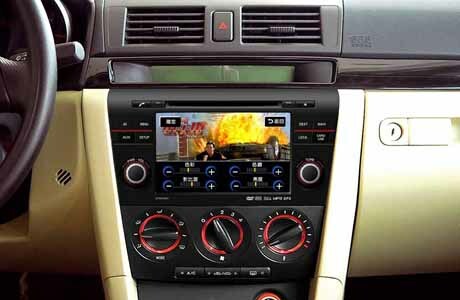 You can get a mobile video system installed by our team of professionals at Performance Auto Sound in Kennewick, WA. There are many options for mobile video systems now-a-days. 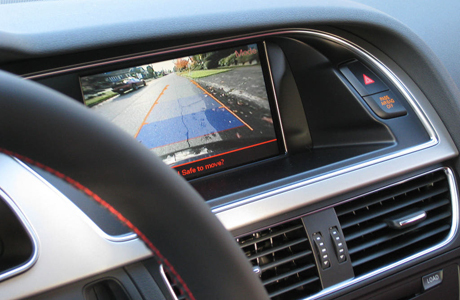 Each car and truck has certain models of video systems that work best in their model of vehicle. Because of this, there are more choices today than there ever has been before. There are screens that attach to the back of the front seat headrest. Also, a screen can be placed in the center of the front car interior roof. 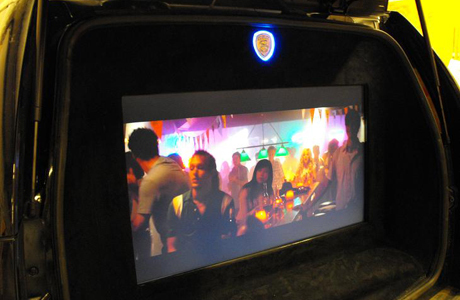 A screen can be securely stored in a center console between two passengers or it can also be a screen that pops up out of a storage container on the side of the car. 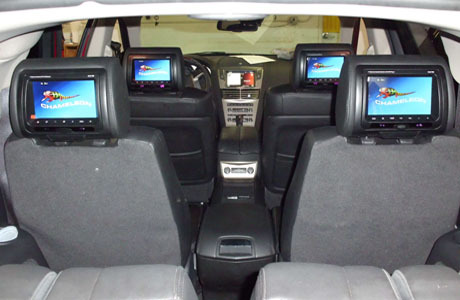 A screen can be placed in the front of the car to accommodate navigation systems. Lastly, a projector screen can be placed in the trunk of the car or truck for a fun movie drive in, without needing to find a place to park. Having friends over for a BBQ with a movie outdoors is a possibility if you have Performance Auto Sound install your mobile video system today. 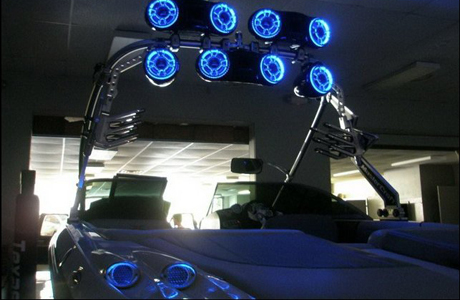 Performance Auto Sound carries the most commonly sought after brands and we also create customized video systems. If you can dream it, we can make it. We pride ourselves in not only good customer service, but in housing very creative staff which will see to it that all your needs are met for your vehicle. Our skilled installers can place video systems in leather, vinyl, plastic, fabric, or any other material you can think of. Let us help make your dream car a reality. Call Performance Auto Sound in Kennewick, Washington to discuss your car video project today. Video systems are not simply for watching videos anymore. Now, cars and trucks can be fitted with video gaming systems so your passengers can play a game while in the car! You can have one video screen installed, or one for each player. The vehicle can be fitted for game controllers, too, so that each player has their own set for gaming. Controllers can also be wireless, so you don’t have to worry about tangling or untangling wires in the car. If you want a simple video system installed so that your drives are peaceful or a tricked out vehicle for your friends to enjoy, you should come to Kennewick’s number one auto electronic store: Performance Auto Sound. 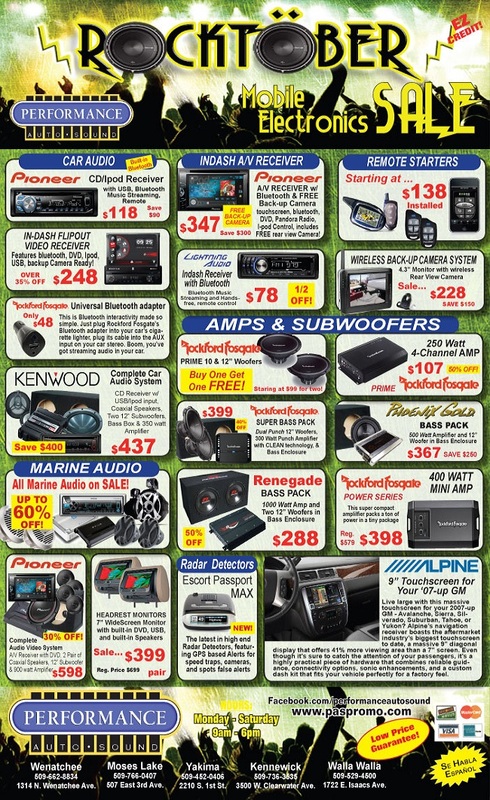 We’ll help you find the best video system for your car, truck, or boat today! Owning a navigation system is one of today’s greatest achievements in pleasant driving. No longer do men have to argue with their wives that they know where they are going. No longer do wives have to argue that their husband should pull over and ask directions. A GPS will do all the hard work for you, leaving the car ride pleasant. A GPS system will even give you turn by turn directions, making sure each and every turn is clearly announced before the turn is made. 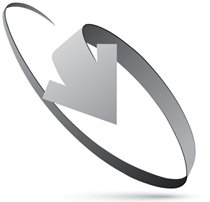 The navigation system will also re-route if a turn is missed and will get you back on track without delay. There really isn’t any reason why everyone shouldn’t own a GPS in their car or truck. Performance Auto Sound in Kennewick, Washington can install your very own navigation system for you, today! 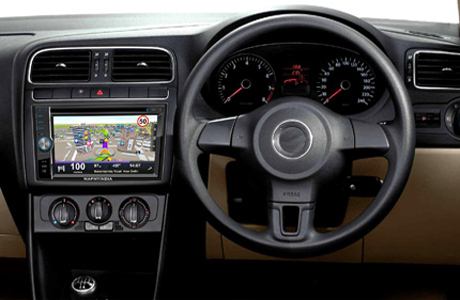 Dash board navigation systems are much safer than the portable GPS systems as they are attached to your cars interior and are not easy targets for thieves. Also, dash navigation systems are mounted in yours internal frame, which makes them less likely to be lost in your car or lose power while in the middle of a car trip in unknown territory. GPS systems have a plugged-in wire, which can be very dangerous if not appropriately placed over the wheel or under the wheel. Plus the GPS must be mounted on top of the dashboard, which directly obstructs the drivers view of the road. Most imbedded GPS systems can also be verbally plugged, so your hands can stay where they need to be…on the wheel. Come in to Performance Auto Sound in Kennewick, Washington today to have our professional team of technicians walk you through how to use our variety of navigation systems. We carry the largest variety of systems with touch-screens and verbal cuing. We can help you choose the right model for your car or truck and get you the best price for your installation. We want our service to be the best service and we aren’t afraid to stick our neck out for it! Our team can walk you through how to use your new navigation system and help you program features on your installed GPS to make your life easier and stress-free. Let us take the guesswork out of your driving schedule. 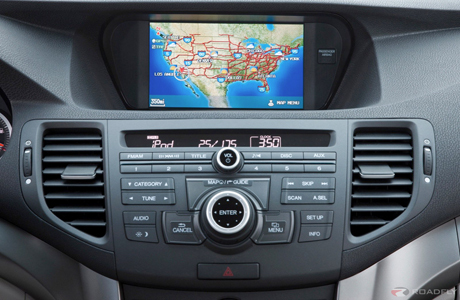 Having a navigation system installed in your car will make driving to new or old locations a breeze as most GPS systems have specifications for avoiding traffic, tolls, bridges, or highways. Don’t take another road trip without a navigation system! You’ll regret it if you get lost one more time and loose precious minutes driving around lost. 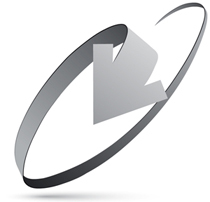 Call Performance Auto Sound in Kennewick, Washington today to set up your appointment today.